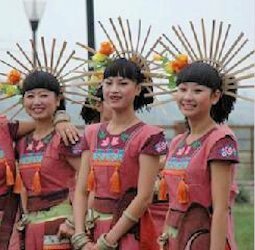 The Gelao ethnic group is distributed among some 20 cities and counties such as Zunyi, Anshun, Liupanshui, Qianjin and Zhijin in northern and western Guizhou Province. Some live also in Guangxi, Yunnan and Sichuan provinces. The Gelao are mountain subsistence farmers and hunters. A Gelao language exists but few use it, instead communicating in Chinese Miao, Yi, and Buyi. Their traditional costume is very unique. Most men wear a long gown buttoned down the front and cover their head with a black turban. The turban is decorated with tassels, which are hung from the top and back, as well as small ornaments such as sea-shells. Women wear long-sleeved, collarless short jackets, the back and sleeves of which are embroidered with fish-scale, rhombus, or triangular patterns. A vest, longer at the back than the front, is also worn. 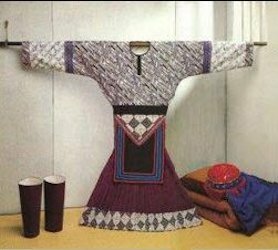 Beneath this is worn a long pleated sheath-skirt made of batik. The wax-printing techniques have been handed down from generation to generation. The edge of the skirt and cuffs are dyed and embroidered to match. The Gelao people refer to themselves as Ling or Jin. Their ancestors can be traced back to the Liao people who lived in Guizhou Province about 2000 years ago. They were called "Geliao" or "Liao" people before the Tang Dynasty (618 - 907) and from the Ming Dynasty (1368 - 1644), they were called "Gelao". With the founding of the PRC, following the consultation with the ethnic group it was decided to agree upon the official name of Gelao ethnic group. The Gelao language, consisting of four dialects, belongs to the Zhuang-Dong group of the Sino-Tibetan language family. Now, only a quarter of the Gelaos still speak this language. The four dialects differ so greatly from each other that even Gelaos in the same county have difficulty in communicating with each other. For this reason, the language of the Hans, or Chinese, has become their common language. 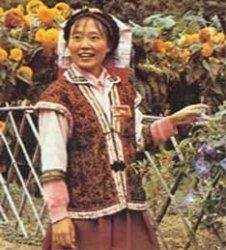 Also, the languages of the Miao, Yi and Bouyei are also used by the Gelao. The Gelaos have no alphabet of their own, so they use Chinese characters for their script.